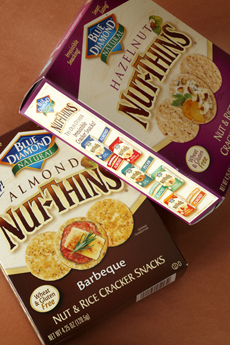 We have a new cracker passion: Blue Diamond Natural Nut-Thins. You may be familiar with Blue Diamond nuts, produced by a California co-op of 3,200 growers. Their almonds have been sold since 1910—one hundred years of health almonds. In addition to almond butter and Almond Breeze almond milk, the company makes nut thins that are well worth a try (unless you avoid potentially addictive healthy snacks). The snack cracker line comprises seven flavors of all-natural, crunchy, baked nut crackers that are wheat-free and gluten-free (and certified kosher by OU). We haven’t tried all six because we’re addicted to the Barbeque, but they include Almond, Almond Cheddar Cheese, Country Ranch, Hazelnut, Pecan and Sea Salt. Loaded with healthy nuts (see the health benefits of nuts), the crackers have 2g of protein per serving, no cholesterol or sugar and are low in sodium. We’re as happy as squirrels.